What ingredients make a speech persuasive, a confession moving, or a debate rousing? 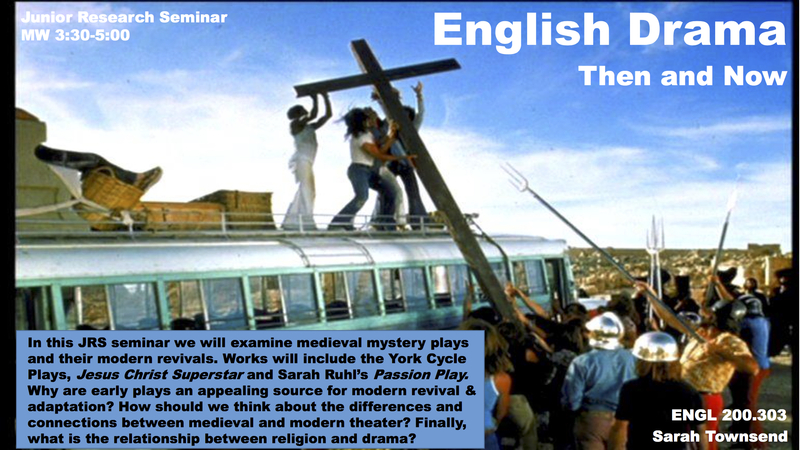 This seminar will explore the politics of staged persuasion in the earliest mystery plays and their modern revivals. Beginning in the medieval period, we will examine how theater was used by the Catholic Church to stage orthodox narrative and disseminate Christian doctrine to a wide public. In particular, we will study the York Cycle Plays which brought the Bible to life for medieval spectators by staging Christian history from Creation to the Last Judgment. Accelerating more than 600 years, we will then consider how modern musical and filmic revivalssuch as Jesus Christ Superstar and Godspell repurposed medieval material. Students interested in pursuing work on adaptation and repurposing will be able to pursue questions such as: Why are early plays an appealing source for modern revival and adaptation? How should we think about the difference between medieval and modern dramas of persuasion? And finally, what is the relationship between religion and drama?